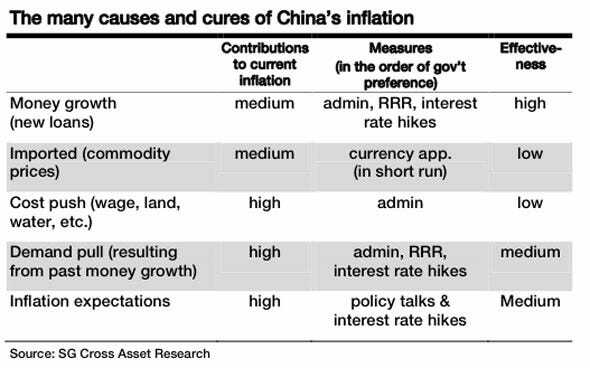 China’s government is only somewhat interested in controlling inflation, and is likely to cut its efforts after H1 2011, according to Societe Generale Economist Wei Yao. That’s because the division of the government that makes the final decision on monetary policy, the State Council, is far more interested in preserving a high rate of growth. Last but not least, we should remember that China’s central bank is not independent and all rate decisions are subject to the approval of the State Council, which seems to be much less tolerant about slowing growth for the sake of social welfare. Piecing all these aspects together, we think monetary policy tightening this year will be front-loaded as the Chinese economy is expected to overheat further and inflation is not likely to peak until H2. So the next four months are going to be full of rate hikes a new government anti-inflationary policy, but how effective will these attempts actually be? Here’s a handy guide to how China will try to control its inflation problem, the tools it has at its disposal, and how effective each is. It seems as if two of the big facts driving prices higher in China, rising demand and bad weather impacting food and other commodities, are pretty much stuck no matter what the government does.